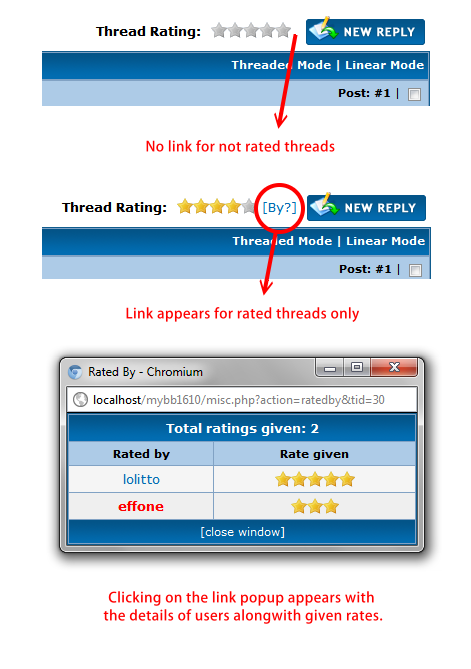 A Plugin for MyBB to display the details of received ratings of a thread. Settings: No settings, just activate and go. This plugin places a link beside the star rating inside showthread clicking on which a popup window appears just like other native popups of MyBB with the details of users rated the thread alongwith given ratings. Users can sort by username or rates given clicking on tcat titles inside the popup. Licence: Demonate standard licence applied. Wow, this is actually something I've always wanted to have but never thought to even look for a mod. I will install this when I get home, thanks! Current time: 24-04-2019, 01:42 PM Powered By MyBB, © 2002-2019 MyBB Group.